I've been amazed at the response to my "Sh*t Ultrarunners Say" video. Last I checked it had over 22,000 hits (and I think I only hit refresh about 5,630 times, so over 16,000 non-me hits). I just wanted to thank everyone for watching and commenting on it. I'm running the Death Valley Marathon on Saturday. Road marathons make me cringe, but this one should be fun. I'm giving the distance another shot, mainly because of the bad experience I had at the Las Vegas Marathon. When the opportunity to run the Death Valley marathon with four great training partners arose, my gut told me to run it. "...the most deadly and dangerous spot in the United States. It is a pit of horrors -- the haunt of all that is grim and ghoulish. Such animal and revile life as infests this pest-hole is of ghastly shape, rancorous nature and diabolically ugly. It breeds only noxious and venomous things. Its dead do not decompose, but are baked, blistered and embalmed by the scorching heat through countless ages. It is surely the nearest to a little hell upon earth that the whole wicked world can produce." -- the New York World, 1894, on Death Valley. Most of my running this year is going to be on the trails, so this is kind of my last hurrah road run for awhile. I'm going into the run without a time goal, and without having done any specific marathon training in the two months since the Vegas marathon. I have been running, though, with one 20 miler thrown in and 4-5 days a week of unstructured, untimed, fun trail runs. 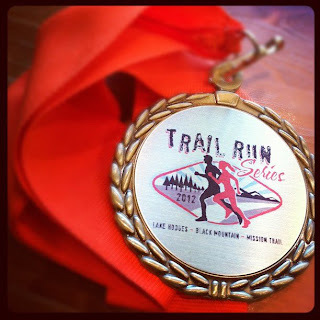 I did run a trail 5K on Saturday and ran it in the low 19s, taking 1st place in the 30-39 (or as I like to call it, thinning to balding) age group, so that takes care of my marathon speed work. It reminded me how difficult and fast 5Ks are. There really is no time to build into the race, and no time to warm-up, because when the race starts, the fast kids sprint. My strategy was to park four miles away and run to the start, then run the 5K easy, then run back to my car, for an 11-12 mile day with a little speed thrown in the middle. The plan was working great until that gun went off and I started sprinting with the high school kids. I hate getting passed and it's really difficult to go easy in a 5K especially when you are being passed, so I went, and ran it harder than I should have, but it was fun, and since I took the start a little easier than most, I was able to finish strong. I didn't save much for the run back, so I hitched a ride with a neighbor. Yesterday I ran for about five miles, the first couple with the dog and the last couple in my new shoes. I won a pair of New Balance MT110s in a raffle (thanks Michael Jacobs and Road Runner Sports), and the shoes are fast, responsive and fun. If you like minimalist shoes, you should check these out. I will probably use them for shorter distances because I like a little more cushion on long runs. Even though I haven't really trained for Death Valley, I still get those pre-race nerves where I spend too much time obsessing over the race which is inversely proportional to the time I spend actually running during a taper week. I had a great conversation with Lucho this week and I'm super excited to be training with him again. Check out the video he did for Ultimate Direction below. His take on running (and on life) is just spot on. I also have a pair of the 110's. I really like them and was hoping to make them my 50k shoes but I think I need something with more cushion but about the same drop. What do you like to race 50k's in? I don't think I am ready for zero drop yet for races but I don't want to go back to 10mm drops either. Any suggestions? Hey Ed, my favorite shoe right now for longer distances is the Brooks PureGrit. It's light, cushiony, has good traction and a low drop (4 mm). I love that shoe.